Not So Cli-Shéa: Jonesing for some Indy! This past weekend I let my nerd flag fly and I went to the Indiana Jones exhibit at the Discovery Science Center. I wanted to go on my actual birthday but we ended up getting home from the desert so late in the afternoon and I wanted to spend as much time there as I could so we decided to wait until the following weekend. We ended up going on Saturday and we spent a good chunk of the day there. In order to get admittance you first have to buy admission to the Science Center itself and then the Indiana Jones exhibit on top of that. So it's best to spend the whole day so that you get your moneys worth, both in the science center and in the exhibit. Not gunna lie, the Science Center itself is very kid-based with lots of hands on activities for kids but we enjoyed it non-the-less. We did the exhibit first. They give you this handheld interactive device that is hooked to headphones and you punch in where you're at in the exhibit and it tells you about what you're looking at. It was really cool, but it made talking kind of difficult. Another fun thing was there was a "scavenger hunt" throughout the exhibit and at the end it shows the virtual "artifact" that you helped uncover during the scavenger hunt and it puts your name up on the wall and everything. It was pretty cool. I think my favorite part was seeing the movie props themselves. Like the infamous Indy costume. There were lots of costumes on display. After the Indy costume, I'd say Short Round's was my next favorite. They even had the stilt shoes he wore when he was driving them! There was also an interactive "play" area which I'm sure was mostly for kids but we of course enjoyed that too. They also had this little kiosk that took your picture and posted it to either your twitter or your facebook. It turned out pretty good and it's a good way to remember the day. It was really fun and I definitely recommend it for any other Indy fans out there. On Sunday I, somehow, convinced Sam to go with me to the Long Beach Antique Market. He recently has gotten really into the show "American Pickers" so I asked him if he'd come with me to "pick" at the flea market and he agreed! I love flea markets, vintage shops and thrift stores. There's something so exciting about going, it's like digging for buried treasure! 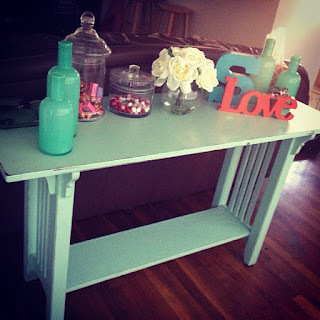 I have been looking to replace the table that sits behind my couch in my entryway for awhile. I've been using one that my parents had in storage. After Danica moved out and took the one that we had with her, I've been on the hunt for one just right. At the flea market I found a perfect one! It was even the perfect shade of teal to match all my fun accessories. We had a wonderful weekend. I'm hoping that this coming weekend is as wonderful. Sam and his brother are going to be doing the Spartan Race on Saturday. I still can't believe he signed up for this crazy race but he's really excited about it, so I'm excited for him. Hopefully he stays in one piece.